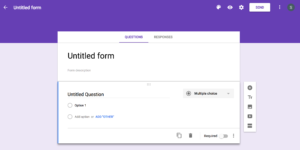 Google Forms is a marvelous, and somewhat hidden, part of Google Drive. So what does Google Forms do? This simple, and free, application makes it easy to create online forms like applications, surveys, and order forms. You can then use the form to gather information. 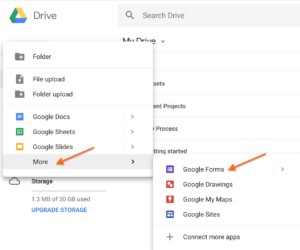 All the information you collect through a Google Form is stored in a Google Sheet so you can use and manage it as you see fit. This is really handy for running client surveys, creating fun (and educational) quizzes, or crafting a job application. To access Google Forms head over to https://docs.google.com/forms or go to your Google Drive. Select “New” and scroll down to “More”. From the second menu, click on “Google Forms”. Like with the other styles of G-Docs, you can start with a blank form or a template. Google has a solid template selection split into three key categories: work, personal, and education. Or, you can start off with a blank form. Google gives you access to a shell. Now it’s time to start filling it in. And what about collecting the answers? 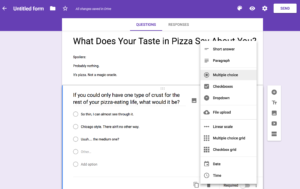 Google Forms gives you a lot of different answer options including short answers, paragraph, and drop-down. To change the type of answers you collect, click on the current answer format on the right-hand side of the question. From there, choose the one that makes the most sense for your form. Want to see a form action? Here’s the link to the form I created while filming the video! To share your form, click on the send button in the top right-hand corner of the screen. Google offers a few different sharing options. Share the form via email. Get a share link by clicking on the link symbol in the “Send via” menu. Get the form embed code by clicking on the embed symbol in the “Send via” menu and embed the form on a web page. Directly share the form through Google+, Facebook or Twitter by clicking on the platform’s symbol in the “Send via” menu. 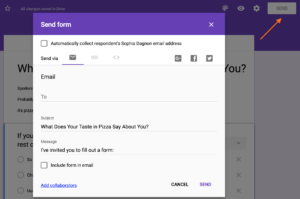 As you share your form with people, and they fill it out, Google will collect the responses. You’ll be able to see the summary in a nice, easy-to-read, chart. You can also go through individual responses– this is really useful for long-form answers. You can export this information into a Google Sheet by clicking on the green sheet icon on the top right-hand side. Google neatly collects and present all the information alongside a time stamp. Now you can interpret and present it in various ways. 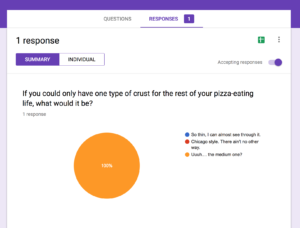 Google Forms is a super-valuable secret weapon. 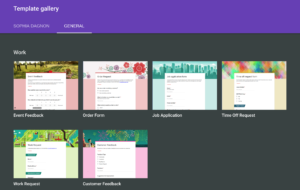 Instead of paying a premium for expensive form tools, you can do a lot of what you need to with Google Forms. 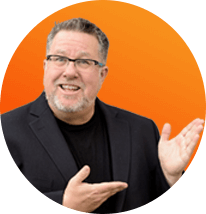 Do you have a go-to forms creation tool? 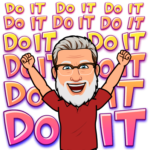 Plan on trying Google Forms? Let me know in the comments! 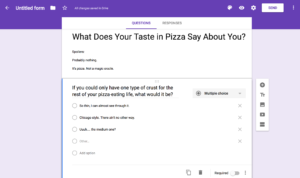 I discovered Google Forms a couple months back and use it to collect feedback from our coaching sessions. It is great! I ALWAYS love your information.